A pleasant 30 kms. excursion out into the countryside. 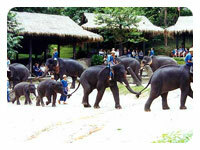 In lush tropical jungle north of the city, watch elephants take their daily shower in a stream. A demonstration of how these talented and trained animals are used in the timber industry is held. Using their tusks, powerful trunks and feet, they push, pull and roll logs. 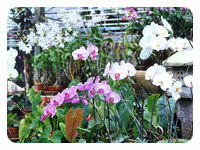 Visit an Orchid Nursery Farm filled with more than 50 different varieties of gorgeous orchid blooms in a dazzling array of colures. A superb collection of butterflies is also available for your perusal and study at a Butterfly Farm.